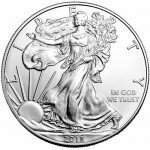 The American silver eagle coin is the most popular silver coin in the world. 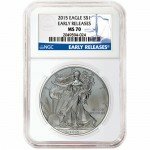 Since its first introduction, the silver eagle has been highly popular among both coin collectors and silver investors alike. The coin is known for its American symbolism, beauty and overall quality. 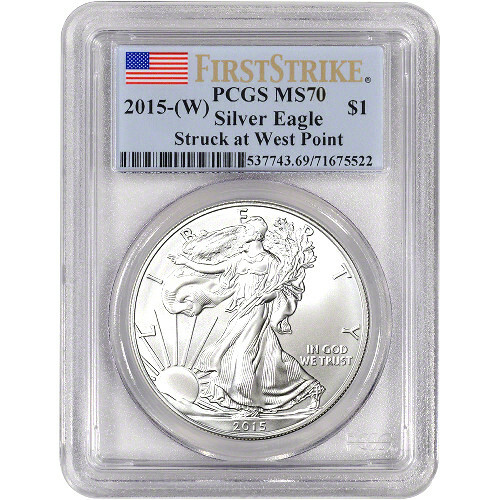 The 2015 (W) PCGS MS70 FS is just another fine example in a long line of silver eagles produced. Graded MS70 by PCGS, the coin is in mint-state condition. Contains one troy ounce of .999 fine silver. Produced by the highly regarded U.S. Mint. First strike batch from the West Point Mint. The coin’s reverse features an eagle and was designed by John Mercanti, a sculptor and former chief engraver of the U.S. MInt. The eagle is holding arrows in one talon and an olive branch in the other. A shield is also depicted. The reverse features numerous inscriptions as well, including “UNITED STATES OF AMERICA, 1 OZ. FINE SILVER and ONE DOLLAR.” The famous motto “E PLURIBUS UNUM” is also featured. These 1 oz silver coins are easily stacked and stored and make a great addition to any coin collection or precious metals portfolio. They also make a great gift. Once you order your silver coins, they will arrive carefully and discreetly packaged at your doorstep within a matter of days. Arriving in brand new condition, these coins should retain their brilliance for years to come. If you have any questions about these 2015 (W) 1 oz silver eagle PCGS MS70 coins, feel free to contact our representatives at 1-888-989-7223. You can also conveniently browse and compare other silver coins by visiting our silver bullion section.